At first glance, starting out on a bike for the first time seems easy – all you need is yourself, some comfortable clothing and the bike, right? Well… Sort of. Cycling actually has a lot more to it than you might think. While you might not see it at first glance, all of those Lycra-clad weekend riders you see out and about on a Saturday morning have put a fair bit of preparation into achieving the perfect ride. Read on to find out what they do – and what you shouldn’t do – to get ready for the road. 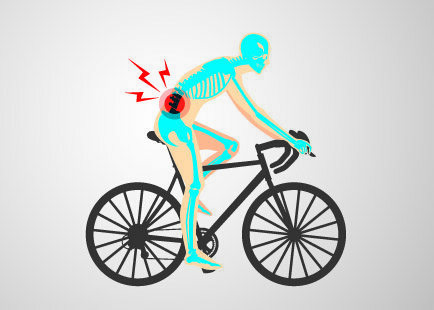 The best thing you can do to avoid injury on the road is to get the right Bikefit from a professional bike fitting service at a physiotherapy clinic. Riding a bike that isn’t set up for your unique measurements – even for a day – can lead to overuse injuries including damage to the tendons, sore muscles and joints and uncomfortable saddle pain during and following the ride (especially for women).The unique thing about cycling is that you are attached to the machine in 5 places, and the bike forces you to go into certain positions to reach the brakes, and have your legs go around the pedals. The other major issue is how repetitive the movement is, with many cyclist riding at a pedal rate of cadence of over 90rpm, that quickly adds up to over 2500 of the same movements per leg per hour. You don’t want to do this in the wrong position! Increasing your exercise amount suddenly is the most common cause of overuse injuries like tendinitis. As with any form of training, it’s best to gradually increase your load, moving steadily to higher levels as your body is ready. Cycling is a low impact sport which is great to reduce injury risk, but due to the repetition, too much too soon will cause injuries. The old rule of thumb is not to increase by more than 10% per week. This is quite conservative but if you stick to this rule, you are likely to stay clear of trouble in this area! Serious cycling requires serious nutrition. If you spend a morning on the road riding at a decent speed, you can easily burn a day’s worth of kilojoules. Don’t risk “hunger flatting” or “bonking” on your ride – for any ride longer than two hours bring along snacks you can eat slowly along the way. Lycra is not everyone’s bag – but unfortunately for many it’s a necessary evil. Funnily enough, most regular riders who make the switch to never look back. Again, the repetitive movement and rubbing of loose clothing can lead to saddle sores, chafing and worse! Appropriate cycling clothing means a far more comfortable and efficient ride. Just as a bike fit conditions the bike for the body, we must also condition the body for the bike. Tight muscles and restricted joint movements may result in extra strain placed on joints, tendons and bones and lead to pain. A great bike fit will consider your physical characteristics and help you address these. This may incorporate stretching and/or strengthening exercises to make you more comfortable or faster (or both) when cycling. Not wearing a helmet, or wearing a poorly fitted helmet, is the most dangerous mistake you can make when starting out riding. Always wear a helmet when cycling, whether you’re riding on the road, on the track or on a trail. Would you like to ride better, longer and pain-free? We are experts in professional bikefit and all things in cycling health. A Bikefit at our West Perth physiotherapy clinic will ensure your bike is fitted and positioned specifically for your unique body measurements. Call 08 9481 1003 or fill out our quick online form to book a Bikefit today.